A pair of gray kangaroos. Scientists from St. Petersburg have found that 90 percent of wild kangaroos are left-handed. Their research could help provide interesting insights into the evolutionary history of the human brain and in understanding the nature of neuropsychiatric disorders. A study of handedness in Australian marsupials conducted by researchers from St. Petersburg State University and sponsored by the National Geographic Society and the Russian Science Foundation revealed that 90 percent of wild kangaroos are left-handed. The findings were reported in the journal Current Biology on June 18, 2015. The field research the work is based on was conducted over the course of several months on the island of Tasmania and in the central parts of the Australian continent in 2012 and 2013. According to Yegor Malashichev, an associate professor of vertebrate zoology at the Biology Department of St. Petersburg University and the head of research on this project, the scientists examined both bipedal and quadrupedal species of marsupials performing various activities, studying up to five types of activity for each species. The study of handedness in animals began six years ago, when the researches noticed that various species of frogs use different legs depending on the action. The scientists did not intend to study marsupials at first, believing that the handedness in those species was negligible. Nevertheless, the examination of the red-necked wallaby and the gray short-tailed opossum specimens in captivity showed that this assumption was incorrect. “Wallabies use their front paws when they stand upright and at those times they display handedness,” Malashichev told RBTH. “When they are in a quadrupedal stance, the asymmetry goes away.” This finding is what motivated scientists to set off for Australia. During field research in Australia, the scientists discovered lefties were as prevalent among the wild kangaroos, as righties are among humans, with grey and red kangaroos showing especially pronounced signs of left-handedness. According to Malashichev, this fact suggests that kangaroos display brain asymmetry that is quite similar to that in humans. Thus there seems to be a link between handedness and bipedalism: the more prevalent bipedal locomotion is in a species, the more obvious handedness is, with most humans being right-handed, and most kangaroos – left handed. Russian scientists have also proven red-necked wallabies use their left front paw to perform actions requiring precision, reserving their right front paw for such tasks when considerable physical effort is required. 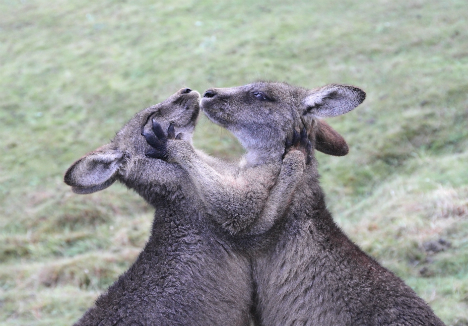 Yet another important finding was that joeys, or baby kangaroos, also exhibit handedness. According to the professor, this discovery could encourage biologists to start studying the brain of marsupials more closely, since it is obviously quite different from the brain of placental mammals (mammals in which the fetus is carried in its mother’s uterus and nourished through a placenta – RBTH). The researchers at St. Petersburg State University believe that studies of this kind could help in understanding the nature of certain neuropsychiatric disorders, such as schizophrenia and autism. Those disorders are thought to be linked to brain asymmetry of which is handedness is a manifestation.